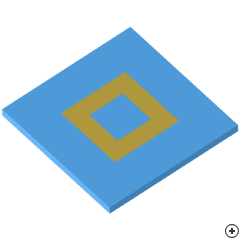 Image of the Square-ring pin-fed patch. Microstrip antennas, also called patch antennas, are very popular in the microwave frequency range because of their simplicity and compatibility with circuit board technology. They are usually operated near half-wave resonance to obtain a nominally real-valued input impedance. The fringing fields act to extend the effective length of the patch, thus, the length of the patch is usually less than a half wavelength in the dielectric medium. The pattern of a square patch antenna is broad with maximum direction normal to the plane of the antenna.